With approximately 35,000 trees, it is no wonder that University City is often called the "Tree City." To maintain the attractiveness of the City, once these trees have shed their leaves, the Street Maintenance Division conducts city- wide curbside leaf collections during the fall and spring each year. The program runs for three (3) weeks in the spring and six (6) weeks in the fall. Residents can rake the leaves to the curb line on the street for collection during scheduled leaf collection periods. Residents shall not place, sweep, or deposit leaves into a street more than three (3) days before the first (1st) day of the established leaf collection time period or after the last day of the established leaf collection time period for that area or zone. To ensure prompt service, leaves must be raked to the curb line the Sunday before collection begins in your area. To check for collection dates in your area, refer to the schedule below or look for the white banners in your area announcing collection times. Yard waste bags are not required if you choose to rake the leaves to the curb line for collection by University City staff during scheduled leaf collection periods. In addition, yard waste bag stickers are NOT required from October 15th - December 31st. Please do not mix other yard waste (gumballs, trash, small tree branches/limbs, brush and grass clippings) in with leaves. Yard waste should be placed in the biodegradable bags to be picked up by the City on your regular trash and recycling collection day. Yard waste bags do NOT need stickers from October 15th to December 31st. Contact Public Works and Parks at 314-505-8560 with questions. Tons of leaves, brush, limbs and grass clippings are collected throughout the year. 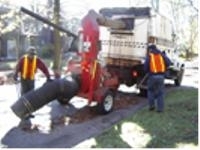 Yard waste and leaves are converted to mulch/compost. A truckload of mulch can be delivered for a fee. Contact Public Works at 314-505-8560, to schedule a delivery. Starting 4/30/2018, Resident has 1 week from delivery to remove leaf mulch/compost/wood chips from the street or alley. We are following the City's Charter Code: Section 220.100: It is unlawful for any person to cause, allow, or maintain for a period in excess of eight (8) days any accumulation of solid waste in or on any premises, structure, lot, land or property within the City, and such accumulation is declared a public nuisance abatable pursuant to Chapter 200, Article I and II of the Municipal Code. Christmas and other holiday trees will be collected during the weeks of January 7, 2019 and January 14, 2019. Trees are recycled at the University City Composting Facility along with small limbs, yard waste and leaves. Non-artificial trees without decorations or lights should be left at your front curb for collection on your regular trash and recycling day. Please do not place trees in the alley. Remember, the trees must be bare, with no stands, ornaments, lights, tinsel, etc. Place at curb without plastic bags. 1992, the State of Missouri banned all yard waste from entering area landfills. To provide an environmentally sound, yet convenient and cost effective alternative, the City offers curbside collection of yard waste to all of its residents. Under the Yard Waste Program, residents must place leaves, twigs, plants, or small brush in 30-gallon biodegradable bags, and each bag must have a yard waste sticker attached. Stickers are not required October 15th through December 31st. Leaves and grass must be placed in brown, biodegradable paper bags with a City yard waste sticker attached. No dirt, wood chips, or logs are accepted in the yard bags. All brush must be tied in bundles no larger than 4' by 2' wide, with branches no thicker than 3 inches in diameter. Yard waste is picked up on the same day as trash and recycling. Curbside pickup of holiday trees occurs during the first two weeks of January on your regular collection day - please remove all lights, decorations and other items. For the convenience of U. City residents, a number of locations are available where yard waste stickers are sold. The stickers are available in packs of 5 for $7.50. Residents can now order yard waste stickers by mail! Minimum order is five stickers for $7.50 by check or money order. Include a self-addressed return-stamped envelope. Residents do not need yard waste stickers on yard bags October 15th through December 31st.